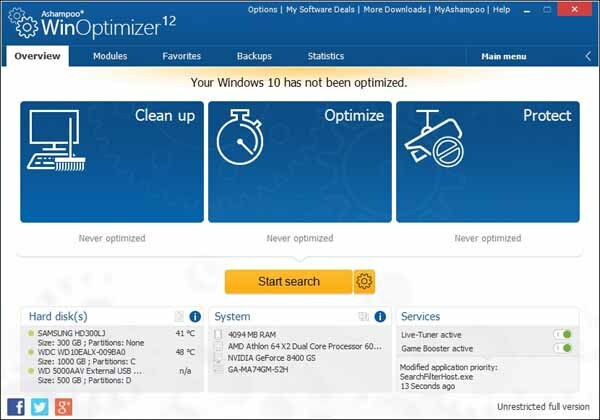 Free download Ashampoo WinOptimizer Latest Version. Not only does the new Ashampoo WinOptimizer 12 look fantastic but it is also easier to use. Improved navigation and search capabilities make working more efficient and intuitive so you can achieve your goals faster. Ashampoo WinOptimizer 12 is constantly evolved to fully support the latest soft and hardware. You can continue using the application with Windows® 10 without worries! Hard disk manufacturers like to bait customers with astronomical performance numbers that frequently don’t hold up in practice. The new HDD benchmark will give you the real picture in full detail. You will be surprised! Experience the next generation of the legendary One Click Optimizer. New search algorithms and continuously updated browser support gives you optimum results! Orphaned files, program remains and temporary files are removed safely and efficiently. Three cleaner modules scan you system for clutter and reclaim gigabytes of space for you! Surfing the web leaves a large number of temporary files and objects on your PC that make your surfing habits traceable. Internet Cleaner protects your privacy and saves you space by deleting these files even on multi-user PCs.